The most recent Gallup survey pegs US unemployment at 9.2%. That is not significantly different from the BLS report at 9.0%. However, the Gallup numbers are not seasonally adjusted the BLS unemployment rate is. Comparing not seasonally adjusted numbers, Gallup shows a .2 percentage point drop in the last year while the BLS reports an improvement of .8 percentage points. Month after month the BLS is consistently lower. Counting part-time workers the Gallup results are even worse. Unemployment, as measured by Gallup without seasonal adjustment, is at 9.2% in mid-May -- down slightly from 9.4% at the end of April. It is also slightly lower than the 9.4% of mid-May last year. Underemployment, a measure that combines the percentage of unemployed with the percentage working part time but wanting full-time work, was at 19.1% in mid-May -- down from 19.3% at the end of April. Underemployment remains as high as it was in mid-May 2010. While Gallup's not seasonally adjusted U.S. unemployment rate suggests little improvement (0.2 percentage points) compared with the same time in 2010, the government's unadjusted results show a year-over-year decline of 0.8 points. Interestingly, Gallup's monthly measures tracked closely to those the government reported in early 2010 but the two trends have diverged since January 2011. The government's not seasonally adjusted unemployment rate is down from last year, even while its data show a total increase between 2010 and 2011 of about 360,000 in the number of Americans employed. This relatively small increase seems closer to what might be expected given Gallup's estimates of the year-over-year change in the unemployment rate as opposed to the government's. Overall, it appears that much of the reason for the decline in the government's unemployment rate over the past year has to do with the approximately 1 million workers who left the workforce -- that is, they stopped looking for work -- between April 2010 and April 2011, and the government's re-benchmarking in January 2011. Gallup's data were not similarly affected by that re-benchmarking. Re-Benchmarking is nothing more than a euphemism for figuring out ways to exclude people from the workforce, artificially lowering the unemployment rate. The number of people in the BLS category "not in the labor force" has been soaring for years. 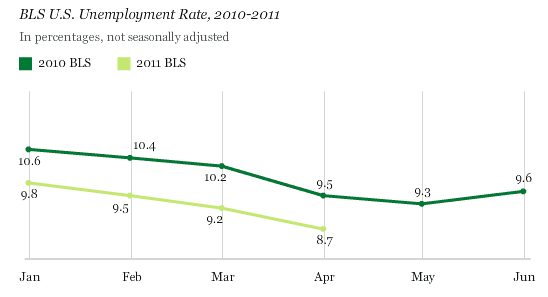 Gallup's U.S. unemployment data suggest little improvement in the jobs situation from mid-May 2010 to mid-May 2011. This contrasts sharply with the government's not seasonally adjusted unemployment data, which show about a one-point decline. As a result, the question arises as to whether there is significant underlying job growth taking place in the U.S.
More important than the year-over-year change in the U.S. jobs situation may be the lack of overall job growth during the first several months of 2011. Gallup data suggest that the improvement in the jobs situation from February of this year through mid-May could be largely due to seasonal hiring factors, given the similar unemployment patterns of 2010 and 2011. This seems consistent with government data showing a seasonally adjusted unemployment rate that began at 9.0% in January 2011, dipped in February and March, but ended up at 9.0% once again in April -- reflecting essentially no improvement in the jobs situation over the first four months of this year. I have talked about those "not in the labor force" on numerous occasions, most recently in Digging Still Deeper In Friday's Jobs Report; What's the Real Unemployment Rate? Logically, one might think one would be unemployed if they want a job and do not have a job. However, the official definition of unemployed is you do not have a job, you want a job, and crucially, you have looked for a job in the last 4 weeks. Every month the government reports "alternative" numbers but even though many of the alternate numbers are a more accurate representation of the unemployment rate, the media focuses on the headline number, ignoring millions who have "dropped out of the labor force" simply because they stopped looking for work. 244,000 Jobs Added Last Month, So Why Did the Unemployment Rise? Last month many were surprised to see the jobs report claim 244,000 jobs were added yet the unemployment rate ticked up 2 tenths from 8.8% to 9.0%. The fact is, employment fell by 190,000 according to the Household Survey and another 131,000 people dropped out of the labor force last month or the unemployment would have been even higher. Fewer people (131,000 to be precise) wanted a lob and looked for jobs in April than in March. In the last year, the civilian population rose by 1,817,000. Yet the labor force dropped by 1,099,000. Those not in the labor force rose by 2,916,000. In January alone, a whopping 319,000 people dropped out of the workforce. In February another 87,000 people dropped out of the labor force. In March 11,000 people dropped out of the labor force. In April, 131,000 dropped out of the labor force. The 4-month total for 2011 is 548,000 people dropped out of the labor force. Many of those millions who dropped out of the workforce would start looking if they thought jobs were available. Indeed, in a 2-year old recovery, the labor force should be rising sharply as those who stopped looking for jobs, once again started looking. Instead, an additional 548,000 people dropped out of the labor force in the first four months of the year. Were it not for people dropping out of the labor force, the [U3] unemployment rate would be well over 11%. My analysis with what is happening is consistent with Gallup except I have the base unemployment rate higher still. In my article (click on preceding link for details), I factored in various percentages of people "not in the labor force" and put them back in the labor force and come up with a range of unemployment of 10.6% to 11.6%. Of course if you factor in part-time workers the number is higher still. Gallup's estimate of 19.1% seems reasonable. Many make the mistake in translating fewer layoffs following a robust Christmas season as the beginning of a huge turn-around in hiring. I propose something different. on March 4, 2011, I said "It is very questionable if this pace of jobs keeps up. I rather doubt it in fact. Looking ahead I strongly doubt the reports will be this good over the course of a year." So far, the Household Survey on which the unemployment number is based, agrees. The Unemployment rate ticked up .2 percentage points last month. Time will tell if this uptick is an outlier or the start of a trend. I suspect a trend change. Many factors suggest a rapidly slowing economy. Please see Huge Cracks in Global Recovery Thesis; Industrial Production Unexpectedly Drops in Germany, France; UK Weaker than Expected for details. You can follow him on Twitter @bamransom and on Facebook: bamransom.